When I was loading up my car to come to Alabama I definitely forgot one little thing…..an UMBRELLA! 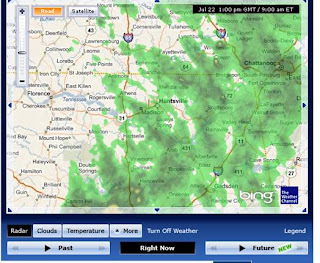 Here’s the radar for this morning! Severe Storms in Alabama = you might as well start looking for a new house because yours ain’t going to be there no more…. 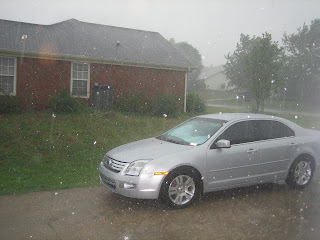 Don't worry that's not hail on my new car...its just the water reflecting from the flash! This is looking from Buck's (Chris's dad) back porch! 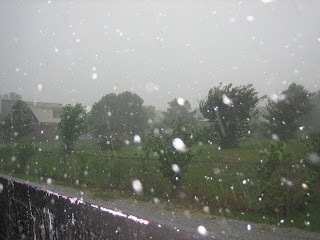 I know today’s post was not about space, but I have two reasons for this….1) RAIN IS AWESOME! 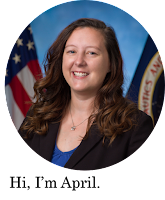 and 2) I am going on tours on Thursday and Friday around the Marshall Space Flight Center so there will definitely be some space pictures and commentary coming! In both cases you will need to scroll down a bit!